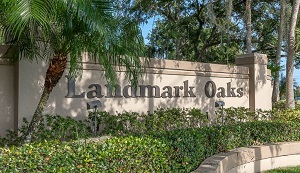 The condos at Landmark Oaks are a great buy in today's real estate market due to their wide-ranging appeal, size and features that can accommodate a variety of needs, and affordable listing prices. With primarily 3/2 and 2/2 units available in this neighborhood, the square footage ranges from over 1000 to just about 2000 - more than enough to decorate and arrange the interior however you see fit. You'll find upgraded kitchen features in many of these homes, along with an enclosed lanai and views of the neighborhood pond! The community pool is available to all residents year round, providing a great way to chat with your neighbors or simply to relax on a hot summer's day! Landmark Oaks is very close to everything you might need in Tampa Bay, Florida! - Tampa International Airport, great schools, multiple shopping malls, famous restaurants and breweries, and everything in between! You would be a happy resident should you decide to live in this wonderful community, so act now - call us to make an appointment to see some of these units in person or even to get your questions answered by one of our expert agents! Selling your Condo in Landmark Oaks? Are you in need of an experienced, highly skilled and competent real estate agent? Look no further than Lipply Real Estate. Our office has agents on call and ready to speak with you about the possibilities and rewarding selling process of your home. We are confident we will match you with a skillful agent that will help you obtain the most out of a possible sale. Enter your contact information in the form below to get started! © Copyright 2019 Lipply Real Estate. All Rights Reserved.